188,000 hectares is an 18 percent increase over 2015. That’s a lot, but the 2014-2015 increase was 42 percent, and the 2013-2014 increase was 39 percent. I wouldn’t call this progress—it may indicate that coca is starting to reach levels at which farmers no longer find it profitable to grow. In an article posted last night to WOLA’s website, I review seven reasons for these big increases. It’s complicated. 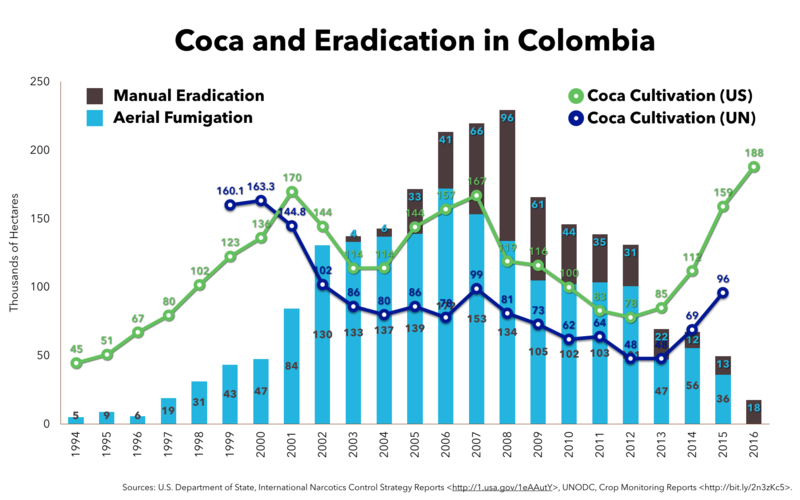 But there’s a simpler question that I’m already being asked: is there more coca in Colombia today than there was when Plan Colombia started in 2000-2001? The U.S. government would say “yes.” 2016 broke the record. The U.S. government doesn’t publicly discuss its measurement methods in detail. The UN Office on Drugs and Crime (UNODC), whose annual reports discuss methods used, will probably say “no” when it releases its next Colombia survey in June or July. That report will almost certainly find an increase, although the UN measure tends to be smaller than the U.S. figure. If the UNODC estimate also grows by 18 percent, that would be 113,000 hectares—well below the pre-Plan Colombia high of 163,000 measured in 2000. The UN measure would need to have grown by 70 percent to break that record.